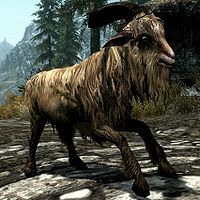 Goats are passive creatures generally found on mountain slopes. They can be hunted for their hides, meat, and goat hornsHF, but occasionally drop nothing. In addition to those found in the wild, domestic goats are also found around farms and towns. Attacking someone's livestock will earn you a bounty. This page was last modified on 1 September 2018, at 12:00.